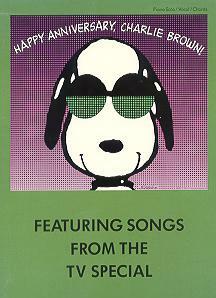 Until recently, most Vince Guaraldi sheet music could be hard to find. 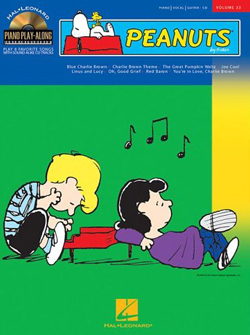 Because of its popularity, "Linus and Lucy" has always been fairly common as a sheet music single. It can be found in current sheet music catalogs, from which any good-sized music store should be able to order. By the same token, "Christmas Time is Here" is always easy to find, particularly around the holidays. Historically, the quest is more difficult. 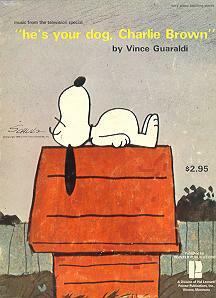 In the late '60s and early '70s, Pointer Publications, a division of what then was Hal Leonard/Pointer Publications, put out a series of easy piano books -- the Peanuts Keyboard Fun series -- most of which were adapted from the early TV specials. The books typically contained 32 pages, and the two center pages featured full-color illustrations from the show in question. The musical contents tended to cross over from book to book; in other words, if you had two books, they'd have some of the same songs, and some unique to each book. For example, the book for He's Your Dog, Charlie Brown includes 12 songs, all by Guaraldi: "Baseball Theme," "Blue Charlie Brown," "Bon Voyage," "Happiness Theme," "He's Your Dog, Charlie Brown" (title theme), "Housewife Theme," "Linus and Lucy" (of course! 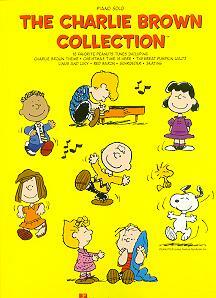 ), "Oh, Good Grief," "Peppermint Patty," "Red Baron," "Schroeder" and "Schroeder's Wolfgang." 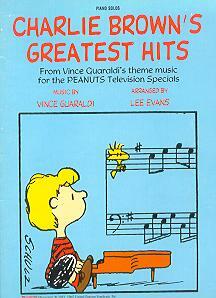 Pointer also published a score book for the first Peanuts feature film, A Boy Named Charlie Brown. Aside from some of the familiar Guaraldi tunes, this also includes incidental music by John Scott Trotter (such as "Bus Wheel Blues") and Rod McKuen's title song, along with the other vocals ("Champion Charlie Brown," etc.). Finally, the Peanuts Music Fun Notebook, also at $2.95, "allows children to learn music through doing -- reading, drawing and coloring exercises. The book features Snoopy Snip-Outs, small flash cards which teach basic fundamentals such as names of notes, note values, rests and rhythm patterns." These are all long out of print and absolutely impossible to find (although if anybody reading these words owns one or more, I'd sure like to hear about it!). In 1984, the Hal Leonard Publishing Corporation, now freed of Pointer Publications, brought out Charlie Brown's Greatest Hits (#HL00240155), originally published at $5.95. This 56-page volume has reasonably complete transcriptions of 18 different songs, all by Vince Guaraldi and arranged by Lee Evans. There was also a beginner version -- #00240154 -- for $8.95. An early songbook to A Charlie Brown Christmas (shown at the top of this document) contains all the music from the same-titled album, and -- better yet -- arranged in Guaraldi's unique style, transcribed for piano by Bill Galliford and David Pugh. 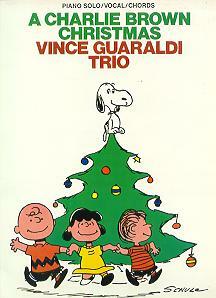 So, you not only get Guaraldi Peanuts originals such as "Linus and Lucy" and "Christmas is Coming," you get his jazzy interpretations of "What Child Is This" and "O, Christmas Tree." The transcriptions are dead-on accurate; if your piano is in tune, you can play along with the CD and sound just like the master himself...or, better yet, surprise your friends during the holiday season by launching into a swinging rendition of "The Christmas Song." The book existed in both easy piano and "regular" versions -- the latter, when first published, was $13.95 for 32 pages -- and was published by CPP/Belwin Inc.
CPP/Belwin Inc.'s Happy Anniversary, Charlie Brown (#P0868SMX) has become pretty hard to find. The 36-page volume has the music for all 11 of the songs found on the CD of the same name, and eight are Guaraldi compositions (including, of course, "Linus and Lucy"). The level of difficulty is higher; these are rich piano transcriptions that sound fabulous when played by somebody who takes the time to learn them well. 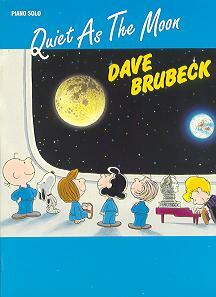 CPP/Belwin also produced the folio book that goes with Dave Brubeck's Quiet as the Moon album, which features music used in the "NASA Space Station" episode of This Is America, Charlie Brown. Published in 1992 at a cost of $12.95, the 32-page volume includes transcriptions of eight original Brubeck tunes, two by Guaraldi ("Linus and Lucy" and "Cast Your Fate to the Wind"), and an up-tempo arrangement of Harry Dacre's "Bicycle Built for Two." The front of the book also includes three pages of text and storyboard illustrations that describe the making of that particular animated episode, as recalled by Brubeck himself. 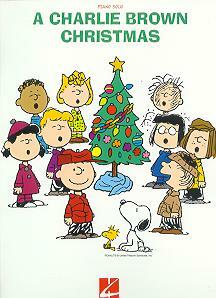 A Charlie Brown Christmas, a collection of 10 songs from the TV special, arranged in each of the five levels indicated above. 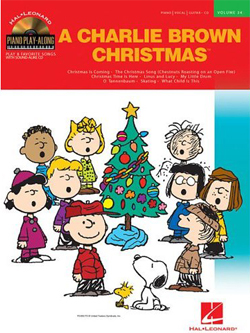 Hal Leonard also re-issued the singles "Linus and Lucy," "Christmas Time Is Here" and "The Charlie Brown Theme," in a style that matches the new books. 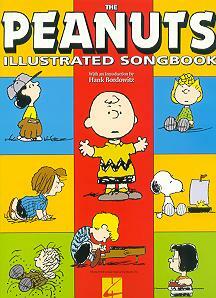 The best release of this bunch, however, was The Peanuts Illustrated Songbook (#00313178, $19.95), an absolutely gorgeous 120-page book that appealed both to budding pianists and plain ol' fans of Vince Guaraldi, who had no intention of setting finger to keyboard. It contained a whopping 30 songs, including several -- among them "Frieda," "Surfin' Snoopy" and the main theme to the Thanksgiving special -- that hadn't been released prior to this point. The arrangements were medium-level, and certainly "dense" enough to sound reasonably true to the recorded originals. Better yet, the front of the book featured an impressive 20-page introduction, by Hank Bordowitz, that discussed Guaraldi and his career, both in terms of his Peanuts work and also his mainstream jazz efforts. George Winston and Guaraldi's son, Dave, were quoted in this introduction, which also included quite a few old photos of Vince at work and play ... along with plenty of full-color Peanuts line art. Information about Guaraldi is even more scarce than his sheet music (and I should know, since I've contributed a great deal of what little exists), and so this volume was quite welcome. 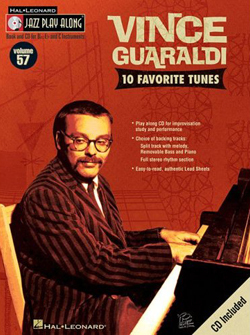 Finally, Hal Leonard also released The Vince Guaraldi Collection (#00672486, $19.95), a true conversation-stopper for folks who absolutely wanted to play precisely like Guaraldi. The book contained note-for-note transcriptions of four Guaraldi originals -- "Cast Your Fate to the Wind," "Christmas Time Is Here," "Linus and Lucy" and "Star Song" -- along with his arrangements of five other cuts from early albums: "Greensleeves" and "O Tannenbaum," from A Charlie Brown Christmas; and "Manha de Carnaval," "Outra Vez" and "Samba de Orfeu," from Jazz Impressions of Black Orpheus. This is the real deal, boys and girls; these nine songs take up 85 full pages, and -- unless you're a prodigy -- you won't master these arrangements during the final few hours before you want to impress folks at a dinner party. These require skill and lots of practice. Some of us waited a long time for a book like this, and we're talking ... well, decades! The book also includes a short (one page) biography that apparently wrote itself, as nobody is credited. There's also no transcription credit, which perhaps makes sense from the standpoint that this is, after all, Guaraldi's own music ... but somebody put a helluva lot of time into this book, and I'm saddened that we'll never know who that was. These two books should keep budding jazz pianists busy, and they're also nice for folks who simply want to learn a little bit more about Guaraldi himself. Of course, it's always possible to sound even better ... particularly when you can "perform" with a back-up band. That's the whole strategy behind Hal Leonard's "Play Along" series, which pairs fakebook transcriptions with a CD of combo performers who "fill in" the missing part. The company released these three books in 2006; each contains a variety of Guaraldi songs -- for C treble instruments, B-flat instruments, E-flat instruments and C bass instruments -- along with combo accompaniment in both split track/melody (for woodwind, brass, keyboard, mallet, bass and guitar players) and a full stereo track of the rhythm section only (for soloists or groups). Peanuts: Piano Play-Along Volume 33 features "Blue Charlie Brown," "Charlie Brown Theme," "The Great Pumpkin Waltz," "Joe Cool," "Linus and Lucy," "Oh, Good Grief," "Red Baron" and "You're in Love, Charlie Brown." Charlie Brown Christmas: Piano Play-Along Volume 34 features "Christmas Is Coming," "The Christmas Song," "Christmas Time Is Here," "Linus and Lucy," "My Little Drum," "O Tannenbaum," "Skating" and "What Child Is This." 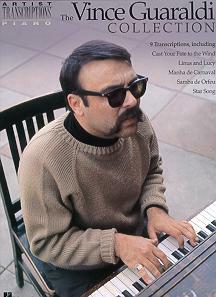 Lastly, Vince Guaraldi, 10 Favorite Tunes: Jazz Play-Along Volume 57 features "Blue Charlie Brown," "Christmas Time Is Here," "Frieda (With the Naturally Curly Hair)," "The Great Pumpkin Waltz," "Happiness Theme," "Linus and Lucy," "Oh, Good Grief," "The Pebble Beach Theme," "Skating" and "Surfin' Snoopy." 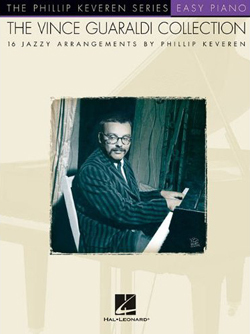 That same year, Hal Leonard also released this Easy Piano collection, with transcriptions by Phillip Keveren. The cover promises "16 jazzy arrangements," and they're not bad, although aimed strictly at the beginning player. The set list includes all the usual hits, along with a few lesser-seen selections such as "The Heartburn Waltz," "Love Will Come," "Rain, Rain, Go Away" and the "Thanksgiving Theme." 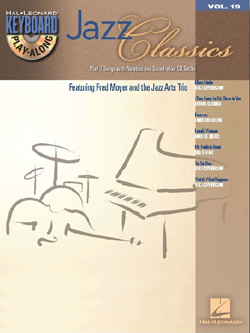 In 2010, Hal Leonard issued volume 19 of the Keyboard Play-Along Jazz Classics Series, with transcriptions by Fred Moyer of seven tunes by luminaries ranging from Oscar Peterson to Bill Evans. One of these is Guaraldi's "Freeway," from his In Person album. This is the only publication (thus far) of this particular Guaraldi tune, which definitely makes this book worth picking up. As always is the case with this Hal Leonard series, the book includes a CD, which features performances by Moyer and the Jazz Arts Trio. That's where things stand at the moment, although we're probably due for another book or two; Hal Leonard seems to release a fresh set roughly once per decade. Stay tuned, and keep those fingers limber!